This are pretty interesting around the DAAC lately. Each year in October we review the organization, get a few new board members and work on tightening things up. This year we have been shaking things up with a new committee structure, 6 committees, each in charge of a different portion of the DAAC’s function. Each committee has a slightly different focus, Art, Music, Volunteering, Promotions, Sunday Soup and my personal fav, the Other committee. 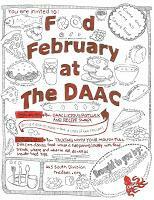 Traditionally known as a music venue, the DAAC has been battling with how to diversify the calendar. So between the Art and the Other Committee we are trying to make some changes. The Art committee, well they put together Art events. So everything else…. falls under the Other Committee. The committee has had a bit of an issue meeting…. but after a first great meeting the first 6 months of “Other” programming has been booked. The boiled down version of the meeting is that each month will have a theme and… a swap meet. The swap meets will be themed and take place the second Tuesday of each month. The Other committee will also program at least one additional event each month….. panel disucussion, class or some… Other type of event. The Breakdown: the DAAC is 7, i have been a board member for 6 years, a little late on the draw but there has been plenty of work, sweet events, great peeps and cool connections. I think George is the only board member who has stuck it out longer then I have and he is the totally backbone grand commander… not to mention he maintains the totally rad DAAC website. We have a new board full of vim vigor and great ideas…..
← Getting ready to…lay the smack down….